All such fitters coated in the gram flour are a special delight of the South Asian cuisine. We can actually dip any vegetable in this coating and fry, it is A1 in every way. 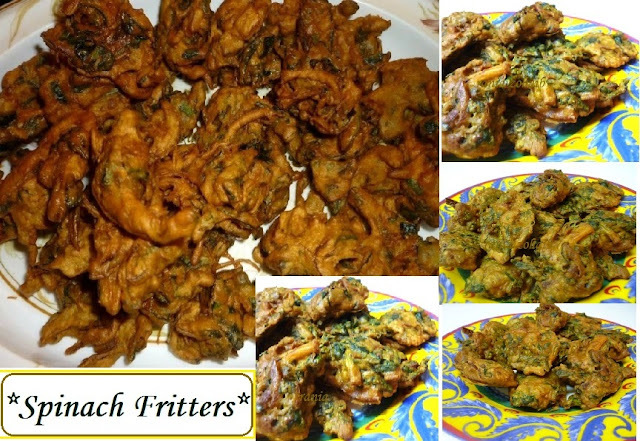 I have made many different sort of Pakorays with Vegetables with meat with Chickem and so on …. Spinach fritters are also one of them. From the rest I added Potato,onions and spinach and made flat pakorays, the spinach makes them really crunchy. -the dough should be very creamy yet not thick, should flow from your fingers when u drop in a plate to check..
-heat a good amount of oil in a big vessel or wok; drop the dough in small portions in the oil directly with your fingers!!! -If u have fears to burn your finger then take a small spoon as they should be small and thin only then they stay extreme crispy, if they are big and thick they will become soft and loose the crunchy spinach effect…. - I did not add any baking powder or soda as many do as that is good if u are making pakoray for karhi or dahi phulikiaan. **A member asked tip for making them crispy. -don’t add soda, and always try to make small and flat pakoray, they cook fast and stay crunchy long .